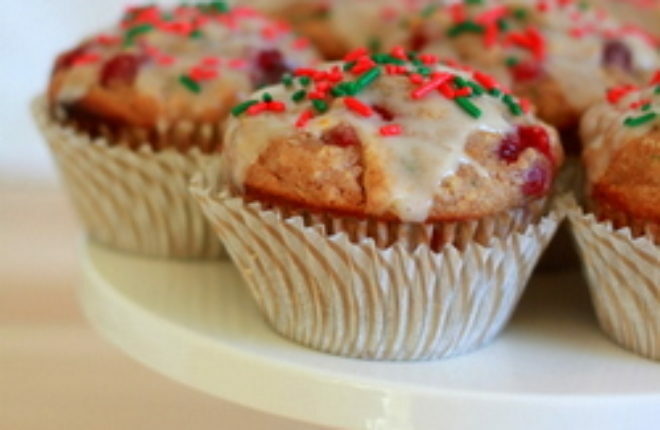 These muffins are perfect for Christmas. 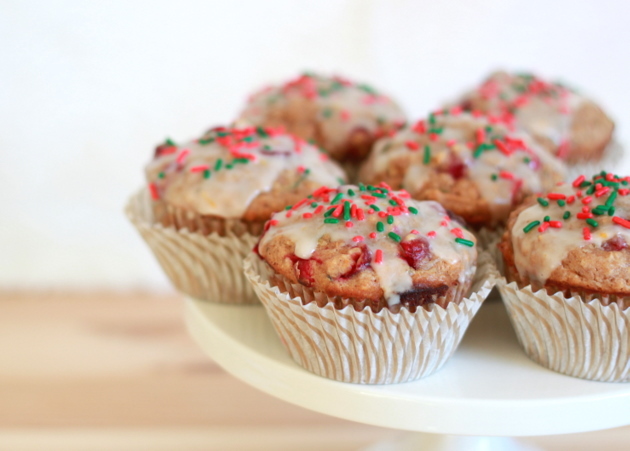 They're chockful of festive ingredients and flavors: Fresh cranberries, zucchini, apples, orange zest ... top with a little orange-vanilla glaze and add red and green sprinkles and you've got just the thing for Christmas morning. 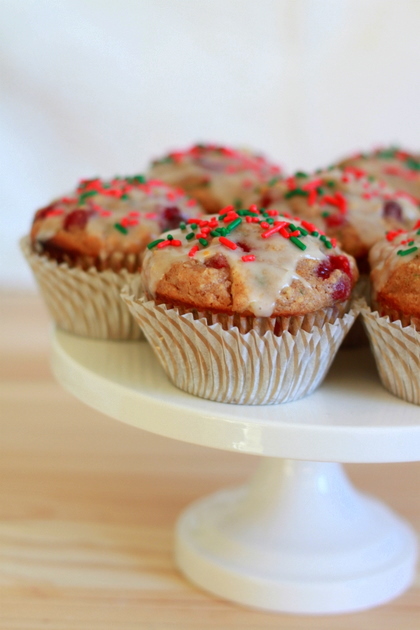 These muffins are perfect for Christmas. They’re chockful of festive ingredients and flavors: Fresh cranberries, zucchini, apples, orange zest … top with a little orange-vanilla glaze and add red and green sprinkles and you’ve got just the thing for Christmas morning. I love the idea of a special dish that’s served only on Christmas morning. Growing up, it was “egg souffle” – an overnight strata-type casserole made with eggs, bread, cheese, mushrooms and chopped-up little link sausages. It was one of the best things about Christmas morning. So good. I’ve carried on the tradition, usually whipping up a sausage-less version for me and another meat-full dish for others; though it never ever tastes as good as my mom’s. Maybe it suffers from the Sandwich Complex – sandwiches are always better when someone else makes ’em. Anyway, this year I’ve decided to add muffins to the mix. Full of festive colors thanks to emerald-green shredded zucchini, granny smith apples, and vibrant cranberries, they’re plenty Christmas-y all on their own, without the added over-the-top touches. 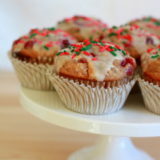 But Christmas is all about going over-the-top – so these muffins are topped with a sweet orange-vanilla glaze and then sprinkled in red and green. And then devoured. I love the tart-sweet cranberries and apples and how the sweetness of the glaze balances the tartness perfectly. I love how fancy and festive and slightly silly they look on a petite white cake stand. I love Christmas. It makes me smile. I wish a very merry, merry one to you and yours. Enjoy it all! Line 15 standard muffin cups with cupcake liners, or grease them. In a large bowl, mix together the flour(s), oats, baking powder, baking soda, cinnamon, cloves, and nutmeg. In a medium bowl, whisk together the buttermilk, applesauce, sugar, brown sugar, canola or vegetable oil, egg, and vanilla extract. 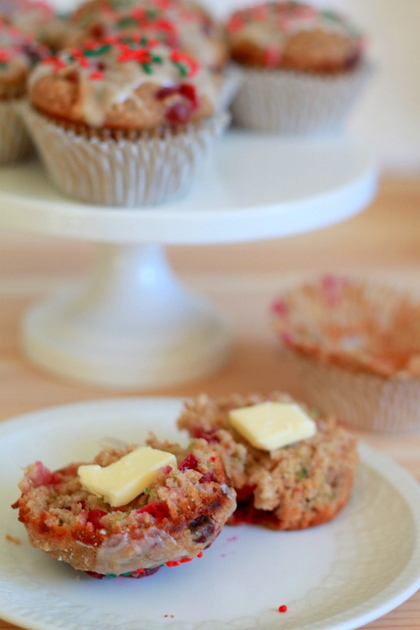 Mix in the cranberries, apple, and zucchini. Add the wet ingredients to the dry ingredients, and whisk together just until incorporated. Divide between 15 or so muffin cups - approximately a scant 1/2 cup each. Bake at 400 degrees for about 20 minutes, or until the tops spring back when touched. Line the counter with a couple of paper towels, and place a wire rack on top. Once the muffins are cool enough to touch, move them to a wire rack. 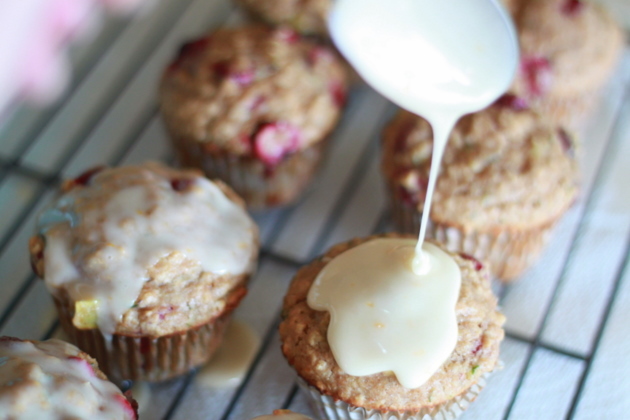 Allow the muffins to cool to room temperature, or close - about 20 minutes. Meanwhile, mix together the glaze. Simply whisk the powdered sugar, vanilla, orange zest, milk and orange juice together until it's glaze consistency. These muffins look absolutely gorgeous! Those muffins look so very very good!! How I wish I had one this morning to go with my coffee!! Congrats on your top 9 today! Oh my gosh, these are absolutely beautiful, and the recipe sounds amazing! What a great way to start your Xmas morning. Thanks for sharing your recipe…I’ll definitely have to remember them! Wonderful muffins! I love the mix of spices and fruit. Great breakfast goodies. Oh, I love the idea of using zucchini for a green touch that’s healthy (and a 4 year-old wouldn’t notice). The muffins look absolutely decadent. Thanks for sharing the recipe. I made these for Christmas morning breakfast and they turned out so good! Delicious! Thanks for the recipe!!! I loved all of the different flavors in the muffin.